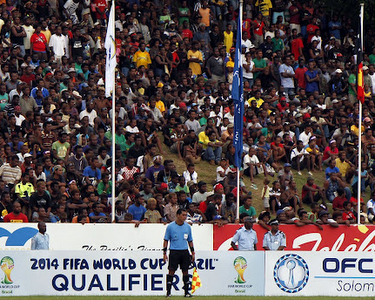 First up is the final 2014 FIFA World Cup&153; Qualifiers match for Solomon Islands on Tuesday 26 March. Solomon Islands will play host to New Zealand in a match that will help to decide who proceeds to the next stage of the qualifying process for the 2014 FIFA World Cup&153;. The race at this point is effectively between New Zealand and New Caledonia. This match is scheduled for 3:00pm in the afternoon on Tuesday 26 March. While Solomon Islands is out of contention the match still has a lot to offer for the home side. A win against the All Whites has remained elusive for Solomon Islands and this presents another opportunity for them to overturn this hoodoo. On top of that finishing ahead of Tahiti Nui will also provide some recourse for this football mad nation which demands the best of its national team. However, it will not be easy especially against the All Whites whose eyes are now on the biggest prize – qualifying for the FIFA World Cup&153; finals. All odds in this match are pointed towards the All Whites who have both history and resources on their side. Earlier this month coach Ricki Herbet named a 19-man squad which featured four England based players in addition to a crop of A-League names. This squad is expected seal the deal for New Zealand’s progress to the next stage and given Solomon Islands record in the competition Herbet’s men will hope for an easy one. However, over confidence will something the All Whites must no bring with them since the Bonitos well have the capacity to cause an historic upset. For Solomon Warriors their qualification for the Oceania Football Confederation (OFC) Champions League is a dream come true but it will also be a test for the club. Having tried to qualify ever since the OFC Champions League was established their breakthrough last year will see the club play internationally for the first time in its history. Having enjoyed great success in the local scene the next few months will reveal if Solomon Warriors can take that success to the international stage. In order to see this transition through smoothly the club called into its ranks at least four internationals to sure up the local talent the club already has. The internationals include talented Vanuatuan Brian Kaltack who has turned down national glory with his national under-20 team for a shot at club fame with the Solomon Warriors. Solomon Warriors will host Amicale in their first match in the OFC Champions League on Saturday 30 March. The Vanuatu side boasts several Solomon Islands stars in Nelson Sale and Joses Nawo who are quite familiar with Solomon Warriors’ style of play. However, if Solomon Warriors local record is anything to go by they will have their familiar ‘army of red’ dominating the grandstand and giving them all the support they need. For local fans the desire to see home sides win on both occasions will be there but the two matches will provide much needed football entertainment. The capital has not seen a competitive match since the last 2014 FIFA World Cup Qualifiers match between Solomon Islands and New Caledonia in October of last year. Thus, big crowds are expected to turn up for both matches.